As a nonprofit, our work would be impossible without the generosity and dedication of our amazing team of volunteers. Today we spotlight one of these hardworking folks: Ruth! Ruth is a culinary student at Johnson & Wales University and started volunteering with Farm Fresh Rhode Island during the summer of 2018. Friends from school and the city initially connected Ruth to the volunteer opportunities at Farm Fresh RI. Since then, Ruth has become her own volunteer ambassador, getting other friends involved with volunteering too. 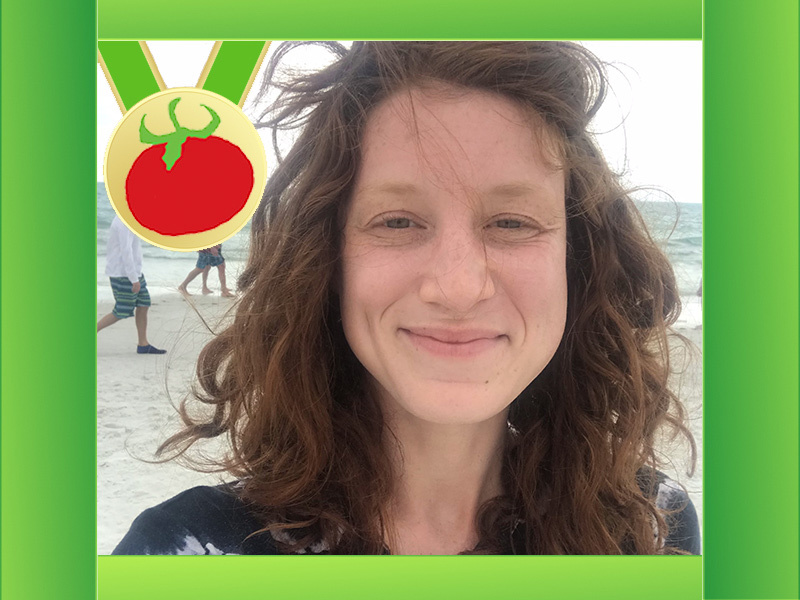 Ruth has spent time volunteering with our Veggie Box and Nutrition Education programs as well as helping with outreach for Farm Fresh RI and our Farmers Markets team. We are so thankful for Ruth’s excitement to connect with the local food system and her commitment to educating herself and her community! Why do you volunteer with Farm Fresh Rhode Island? To support the local food system, understand more about the community, and aid in nutrition education. How has volunteering with Farm Fresh Rhode Island impacted you and/or your community? I feel like, through my volunteering and involvement with Farm Fresh, it has given me a stronger identity to RI and Providence. I moved here for culinary school but Farm Fresh has strengthened my connection with food in a way school did not. It’s one of the first things I mention when I talk about the place I live because it means so much to me. Do you have a favorite memory from volunteering with Farm Fresh Rhode Island that you’d like to share? I had the pleasure of volunteering with the Veggie Box program for a few months and it was always so much fun being on the assembly line working with other members of the community to pack fresh produce. I think one of my favorite memories is when my roommate and my friend came to help pack over 200 boxes and it was my roommate’s birthday and we just had such a good time even though we were swimming in boxes. Why do you support Farm Fresh Rhode Island? I think it’s important to connect the community with the surrounding farmers and food suppliers. The farmers markets are a great way to connect to the food system and the community you live in. When you’re not volunteering, what do you like to do in your spare time? I like to cook! I like to volunteer with other local (food related) organizations. I like to spend time in nature when possible, dance, hang with my friends. What would you tell someone who is thinking about volunteering with Farm Fresh RI? Do it! There is so much to gain from volunteering. It’s a great productive way to spend your free time. What is your favorite local fruit or vegetable? Mouse Melons and local apples! Thank you, Ruth, for all of your dedicated volunteering! Already a Farm Fresh RI volunteer and want to be spotlighted?